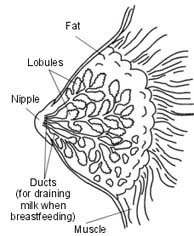 You have a very small cancer in the breast, or there is something in your breast which may be one. The plan is to take out the diseased part of the breast with a clear rim of healthy breast. At the same time glands will be taken from your armpit (axilla). This is what is meant by a wide excision and axillary sample. Sometimes all the glands are taken from your armpit. This is called an axillary clearance. The two pieces of tissue are looked at under the microscope in the laboratory. You will have a general anaesthetic and be completely asleep. A cut is made in the skin of the breast over the swelling. Sometimes a piece of skin is taken out as well.The swelling or problem area in the breast with a rim of breast tissue is taken out. Often glands can be taken from the armpit through this cut. If the first cut is too far from the armpit, a second cut is needed there. The breast may end up a little smaller. The operation takes about 45 minutes. Usually there is a fine plastic drainage tube in the wound. The drain comes out through the skin usually in the skin fold under the breast. The skin is closed with stitches or clips. The tissue is sent to the laboratory to be looked at under a microscope to find out what is going on. It takes about one week to get an answer. You may well be able to have the operation on the day you come in, and go home the same day. You may need to stay in for a day or two, if the swelling is large, if you are over 50, have other illnesses, or if you cannot manage at home. Removing the whole breast, (a mastectomy) would be equally good treatment as a first choice, but it is not necessary in your case. X-ray treatment on its own would not be as good in your case. Neither would drug treatment on its own. The same applies to alternative therapies such as aromatherapy and reflexology. If you do nothing, the problem in the breast will get steadily worse. Stop smoking and get your weight down. (See Healthy Living). If you know that you have problems with your blood pressure, your heart, or your lungs, ask your family doctor to check that these are under control. Check the hospital's advice about taking the pill or hormone replacement therapy (HRT). Check you have a relative or friend who can come with you to hospital, take you home, and look after you for the first week after the operation. Bring all your tablets and medicines with you to hospital. On the ward, you may be checked for past illnesses and may have special tests, ready for the operation. Many hospitals now run special preadmission clinics, where you visit for an hour or two, a few weeks or so before the operation for these checks. There may be some discomfort on moving. Pain killing tablets or injections should easily control this discomfort. A general anaesthetic will make you slow, clumsy and forgetful for about 24 hours. Do not make important decisions, drive a car, use machinery, or even boil a kettle during that time. The wound may be closed with stitches, clips, or paper strips, which need to be taken out by the nurses about a week after the operation. Sometimes there are stitches under the skin instead. These melt away, so that the wound does not need any more attention. You can wash, bathe, or shower as soon as the stitches, clips or paper strips are taken off. Soap and tap water are quite all right. Salted water is not needed. The hospitals will arrange a check up about a week after you leave hospital to give you the results. The nurses will advise about sick notes, certificates etc. Have plenty of rest. Take mild painkillers as needed to control discomfort. You can drive as soon as you can make an emergency stop without discomfort in the wound, i.e. after about 2 days. You should be able to return to a light job after about 3 or 4 days , and any heavy job within 2 weeks. Complications are rare and seldom serious. Bruising and swelling may be troublesome, particularly if the wound was large. The wound swelling may take 4 to 6 weeks to settle down. Infection is a rare problem and settles down with antibiotics in a week or two. These notes should help you through your operation. They are a general guide. They do not cover everything. Also, all hospitals and surgeons vary a little. If you have any queries or problems, please ask the doctors or nurses.